Some Real-Life Advice from our 2010 Experience! Only Americans order the large Coke at McDonald's. Eat fresh made guacamole and pico in moderation or be ready for a long night. Fireworks are a nightly occurrence (all night, every night). Roosters actually can crow at all hours of the day (and do). Goats can climb trees (who knew???). (A heavier suitcase is preferred over small tool ridicule). ALWAYS carry a machete (a large butcher knife will do in a pinch). When you think you are tough, try carrying 200 lbs of cement on your shoulder. A family of four can indeed ride on a small 200cc motorcycle. When visiting the Black Market it is wise to avoid wearing your PJs! P.S. 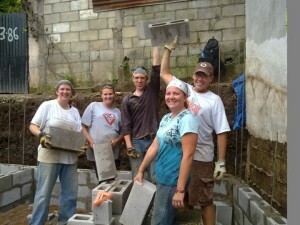 Looking forward to Guat 2011, Team B.A.! Team B.A. will be in full force and with 3 new inductees. Can't wait!